Sounds delicious.....Gourmet Chocolate holds chocolates and gifts online. Thanks for the shout out. When are you gonna get on the food blog as an honourary member? Send me an email (kibabin@gmail.com) and i will invite you. All the dishes sound so good. Indian restaurants here don't come close at least not the ones in the suburbs. Haven't had good Rabri for so long. @ sig: Thanks! Yes, the Chengdu Claypot Chiken is awesome! @sandeepa: Yeah, this is probably the only place I find great rabdi now; for those who didn't get it, "matir bhar" is bengali for earthern bowls, and called "kullad" in Hindi. @velverse: Welcome to my blog! 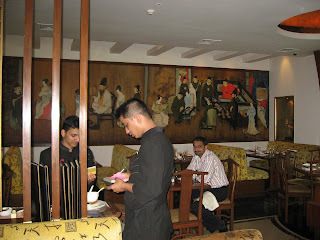 Mainland China in Delhi: Wow! I don't know much about Pune, but those cookies! Damn I could eat one right now! Hey, thanks for the meme! This will be my first one - can't wait to participate!! Shantanu,is it possible for you to fwd me ur email address, needed some advice(if that's not too much trouble)??? Thanks for the meme, sorry I'm late in returning the favor! So I finally got to it and finished the meme. Thanks again! 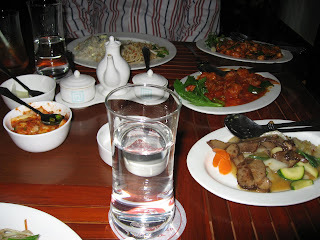 Just visited Pune for first time, and took your recommendation for Sigree - great meal and atmosphere, many thanks!! Will check out some other recommendatiosn over time as i will be here a lot over next few months. Any more "basic" recommendations? @allank: You are welcome! Pune's food options are growing every day. 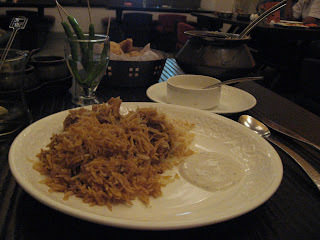 For Indian food, Chingari at the Le Meridian is expensive but good. Whispering Bamboo at the Taj Blue Diamond is great for Chinese food. Koregaon Park has a lot of smaller restaurants and lounges/bars for the evenings (Malaka Spice for South-east Asian cuisine, Arther's Theme for Frnch food with a twist, High Spirits for and Indyaki for drinks). All these wonderful options are not doing any good to my waistline!!! Hi SG, Thanks for the info about Bombay Brasserie. Till now I have trusted Sigri and Kwality for north indian food. Yes, Sigri but never ventured into Bombay Brasserie! but I wonder why the table layout in Bombay Brasserie looks so similar to Sigri. @windchill: Heh! Unfair isn't it? The writer of www.shantanughosh.com has written a superior article. I got your point and there is nothing to argue about. It is like the following universal truth that you can not disagree with: Nothing is ever as simple as it first appears I will be back.